What a great idea to do a FREE decoration for Halloween. As a kid I always loved going to houses who decorated and gave me great memories when I was Trick-Or-Treating. Sometimes just the simple decorations were just as cool to me – although I absolutely loved the houses that gave me chills to walk up to. 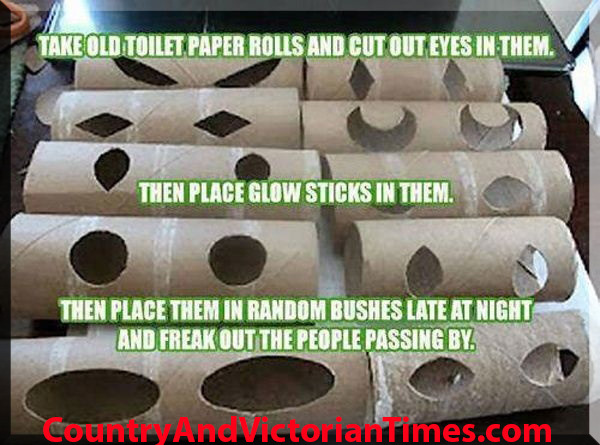 For this decoration you just need toilet paper rolls and paper towel rolls and glow sticks (get these at a dollar store where you can find a large package of bracelets, necklaces etc. for a dollar). Cut slits and ovals and anything else you can think of in these tubes. Don’t worry about the exterior of the tubes as it will be dark and no one will see anything except the glowing eyeballs. Hang them from fishing line, stick them in bushes, or stick or hang them in trees. Think of all the nooks and crannies that these can go into. When that special night starts to happen snap your glow sticks to turn them on and stick them inside the tubes. PS: This time of year they also have those look alike candles that are small that are actually a light bulb which you could use. This entry was posted in Crafts ~ DIY ~ Projects, ~Halloween and tagged cheap, decoration, free, glow stick, or, paper towel, Shopping, Toilet paper, treat, trick, trick-or-treating, ~Halloween, ~Party. Bookmark the permalink.